Dancing Queens ... and King! Here are a couple of videos of the kids dancing and being silly. FYI, yes, they love the song LOW ... LOL... good thing the lyrics go by real fast and they can't understand anything but the chorus! I love how in part of the video Zach is shaking his head at Daddy that he doesn't like the song he put on ... LOL .... they crack me up! Well two weeks into taking the training wheels off we're riding the ramp and "popping wheelies"!! Well, it's been 6 months now that we've had Willy and I think it's pretty safe to say that "Will and Grace" are just not gonna be friends! The girls ended up winning "Most Original Costume" for their Dorothy costumes. Zach didn't win a prize for his costume, but one of his sisters (Ave) gave Zach her medal for being the "bestest brother". They all got to pick something from a huge box of toys and had Halloween cookies and juice for the walk back home! It is so nice that our neighborhood does this for the kids every year!! It was a great afternoon - it wasn't too hot, it wasn't too cool! We missed having Nana and Moxie here this year for the parade, Moxie looked so cute in her costume last year!! 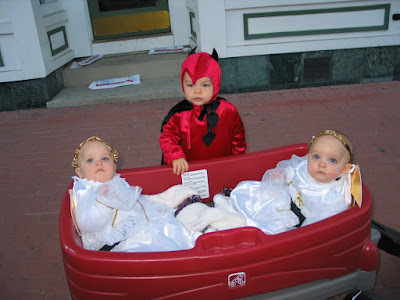 The girls first Halloween (2006) .... 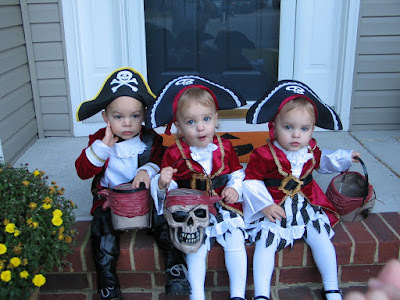 I think if we did this "theme" again, they'd all be little Devils! 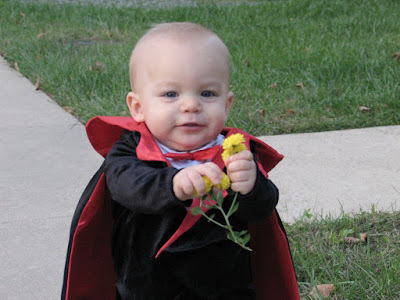 I LOVED his Vampire costume! (2005)! This is probably my favorite one of all of his! 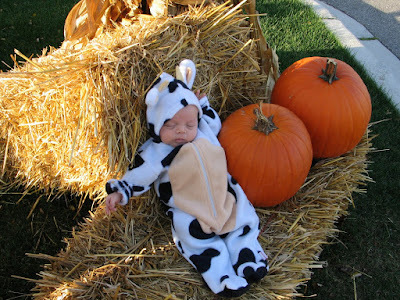 We had a great time at the pumpkin patch this year … we did a hayride, the petting zoo, pony ride and a few carnival rides before it started to drizzle and we had to make a mad dash to pick out our pumpkins and hit the road! Here’s some pictures from Zach’s game this weekend …. he looks so serious! This is a kid from Zach’s class (JJ) and they were hamming it up when JJ got to 3rd base!! My little baby has OFFICIALLY become a big boy. Not only did he turn five this month. Not only did he start Kindergarten ....he no longer has training wheels on his bike!!! He has been wanting to take them off for awhile and I tried a few months ago but he was definitely not ready so we put them back on. He asked me to take them off again last week, so I did - and we took him to a grassy field (figuring it hurts less when he falls) one night this week ... and wham! He can ride his bike!!! There was even more excitement in our cul-de-sac this week, Zach's buddy from across the street (Brody) also learned how to ride his bike without training wheels on the same day! What's next? The keys to the car??? Why does time have to go by so fast?